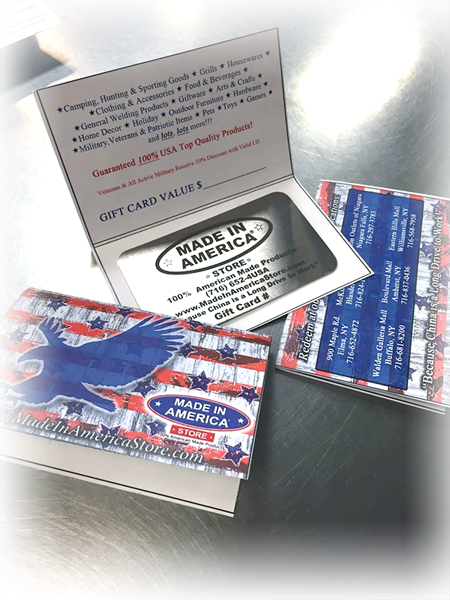 Currently, our gift cards are not able to be purchased online, but you can still purchase them over the phone through our World Distribution Center. To order, please call 1-716-805-3382. Our World Distribution Center is open Monday through Friday, 8:00AM EST to 4:00PM EST. 1. Go online to www.MadeInAmericaStore.com. 2. Browse our 9,000+ U.S.A. made products. 3. Make a list of all the products you'd like to purchase (including the SKU's, if possible). Thank YOU for Buying American! Together, We Can Create and Save American Jobs with Every Purchase!